Q Are persimmon seeds edible? I was thinking of grinding persimmons, seeds and all in a vitamix blender and was wondering if the ground up seeds would be ok to eat? A What a great question. I often put seeded grapes and seeded citrus into my morning smoothies, and sometimes toss in an apple or melon, seeds and all, but that’s about it for the seeds except for the obvious tomato, cucumber, and zucchini. 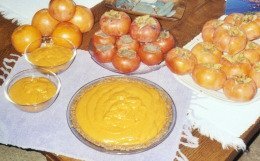 I have by accident blended and consumed a good many persimmon seeds, but don’t usually add them intentionally. As far as I know there is nothing wrong with eating them other than they may not fully blend in the smoothie unless given enough time which I try to limit when blending. I have heard they may be roasted and ground for a coffee substitute, and that some find the seeds valuable for their oil, other than that???? Apple seeds contain minute amounts of strychnine, a known poison so you wouldn’t want to eat copious amounts of them daily, and other seeds contain chemicals that may also be harmful if ingested, the cacao seed is one such seed. Apricot seeds are renowned for their healing abilities and nutritional benefits as are flax, hemp, pumpkin, sesame, and chia seeds.